Instagram Stories are a good way to share your thoughts and experiences on Instagram throughout your day. 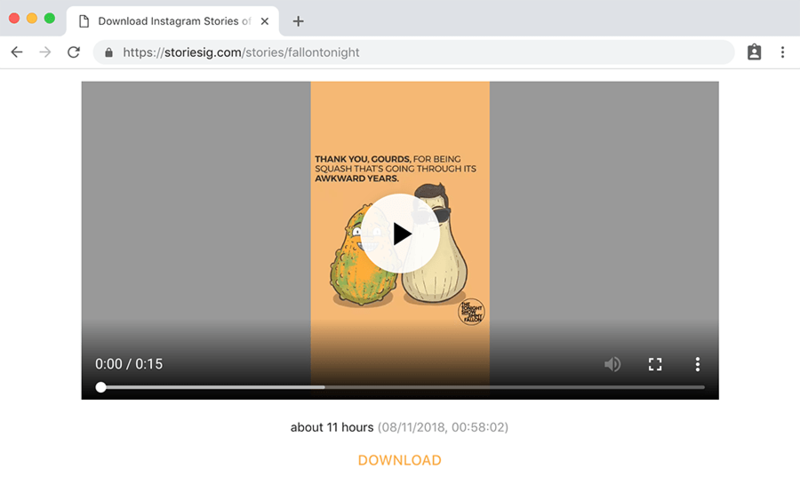 Like its counterparts on other social networks, Instagram Stories are available on one’s profile for 24 hours. It’s quite exciting to share your own stories on Instagram. But every once in a while, you might come across a photo or video in someone else’s story that you’d like to save locally for later access. Unfortunately, the official Instagram app on iOS and Android doesn’t allow you to do that. In this article, we’ll explore a few third-party tools and apps that allow you to download photos and videos from someone’s Instagram Story, and save them locally on your iPhone, Android or computer. Probably the most preferable way to download photos and videos from Instagram Stories on iPhone is using an app called Instagram++. Instagram++ is a third-party tweaked version of the Instagram app, which includes additional features that are not available in the official version. One such feature is the ability to save media from Stories as well as normal posts to the Camera Roll. Being an unofficial tweak, the app is not available on the App Store. And usually, the way to get such an app installed on your iPhone would be to jailbreak the device. But thanks to BuildStore, you can easily install Instagram++ on your iPhone without jailbreaking it. For the uninitiated, BuildStore is an $11.99/year per device subscription service that allows unrestricted access to Instagram++ and a number of other apps and tweaks available in the BuildStore repository, that you would not find on the App Store. Note: Some of the apps available on BuildStore might be ad-supported and may include provisions for donations or in-app purchases to remove ads or access additional functionalities. Once you have signed up to BuildStore and started your subscription, installing Instagram++ is quite easy. Note that you’d need to uninstall the original Instagram app from your iPhone in order to install the tweaked version. Uninstall the original Instagram app from your iPhone if it’s already installed. Sign up for a new BuildStore account and register your iOS device. On your registered iOS device, open Safari and navigate to the Instagram++ app page. The app will be installed on the iPhone just like any other app. Note: You should be logged in to your BuildStore account in order to access the Instagram++ app page, otherwise you would be automatically redirected to the builds.io homepage. Tap on the user story from which you want to download a photo or video. While the particular photo or video is displayed, tap the Download icon located in the bottom-right corner. If prompted, select the resolution of the photo or video that you want to save the file and then select the location (Camera Roll, Album, etc.) where you want to save it. The particular photo or video will be saved to the selected location. It is worth to mention here that it’s indeed possible to install apps from outside the App Store without jailbreaking your iPhone, for free. But then again, one of the prominent challenges, in this case, would be to find a suitable app file (IPA) which isn’t potentially compromised. Moreover, if you don’t have an Apple Developer account, you’d need to reinstall these apps every 7 days in order to continue using them. The installation process is also comparatively tedious and requires you connect your iPhone to your computer. BuildStore, on the other hand, ensures a seamless experience. The apps available on BuildStore are also less likely to be compromised. According to BuidStore’s content policy, any application submitted to their repository “MUST NOT harm the device or device owner”. They are also updated regularly to introduce new features, bug fixes, and compatibility tweaks. However, BuildStore does not claim any responsibility for any action taken against the user by original app developers (for example, disabling of accounts), for the use of tweaked apps. 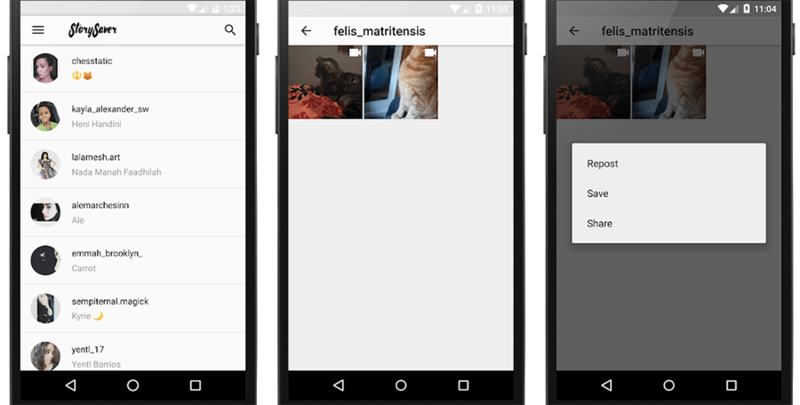 If you’re an Android user, it’s much easier to save photos and videos from Instagram Stories. There are, in fact, a few apps on the Google Play Store that let you do just that. For this example, we shall use an app called Story Saver, but you can also use other similar apps based on your preference. Download and install Story Saver from the Google Play Store. Launch the app and log in to your Instagram account. On the main screen, you’ll see a list of all the users that you follow. Tap on the user whose Story you want to download from. Swipe right to play them in full resolution. You may also search for users by their usernames. Tap on a photo or video from the Story that you wish to download and then tap on save. The particular photo or video will be saved to the Gallery. This method may be preferable for some users, as it works on any platform, and usually does not require you download an additional app. Of course, on iOS, you might have some difficulty downloading media files directly from the web using Safari. Thus we recommend you to use a suitable download manager app with a built-in browser for this purpose. Documents from Readdle is one of the popular alternatives. On other platforms, like Android, macOS or Windows, the default web browser should suffice. The below steps will guide you to save Instagram Stories to your computer, iPhone or Android device. Open a web browser and navigate to storiesig.com website. Provide the username of the particular user whose story you want to save and hit the return key. The website will display the number of photos and videos available in the story. Click on the number to view the individual contents. You should find a Download button below each of the photos and videos available in the story. Click on the download button to save the corresponding media locally to your computer or mobile device. The selected photo or video will be saved to your device. 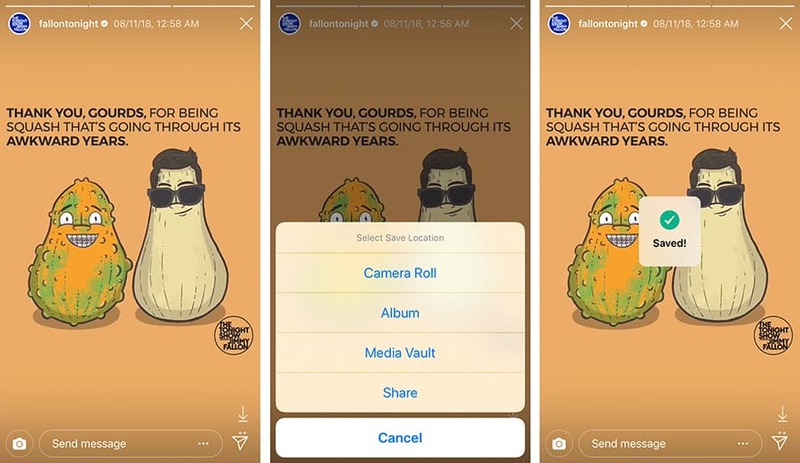 Thus, you can download photos and videos from any Instagram Story to your smartphone or computer. If you know of any other apps worth mentioning here, let us know in the comments below. Disclaimer: The article is only intended as a knowledge base for saving and downloading Instagram Stories. 7labs may not be held responsible for any misuse of the information provided in this article.